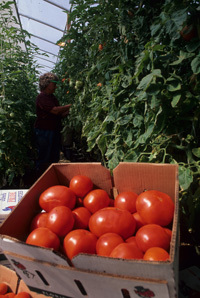 Postharvest handling of tomatoes, including packaging, is important to overall food safety and product quality. 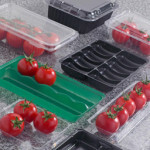 This fact sheet describes harvesting, handling, storage and packaging procedures that will help maintain fruit quality. It also discusses the economic aspects of marketing the crop. This website features the CoolBot which is used as a programmed micro-controller to direct an air conditioner’s compressor so that you can keep your flowers and farm produce thermostatically controlled. Sustainable production presents unique challenges, from nutrient sources to variety selection based on disease resistance. This guide covers the basics of sustainable tomato production, produced by the USDA’s Agricultural Research Service. NC Fresh Produce Safety Portal hosts multiple resources on postharvest handling. Their resources pertain to postharvest equipment, cooling and handling, quality and testing, storage and transportation, packing facilities, and refrigeration units. U.S. Grade Standards provide the produce industry with a uniform language for describing the quality and condition of commodities in the marketplace. The following links provide information about tomato grade standards depending on the market for the product.